Congratulations to the first 10 finishers of Great Pumpkin Island! Linus may wait all night for the Great Pumpkin, but we didn’t have to wait long for the first 10 Poptropicans to complete Great Pumpkin Island. Congratulations to the first 10 finishers! We’ll look forward to seeing many more of you earning that Island medallion! Ahh, how I wish I was a member. Well all I have to say now is…. nothing actually. Lucy has joined the gang! Lucy has joined Linus and Charlie Brown in the Pumpkin Patch! Lucy has joined the fun — or has she shown up just to yell at her brother? There’s only one way to find out. Charlie Brown and Linus both have more to say this week, too. 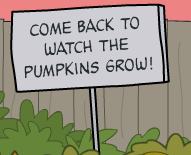 If you haven’t seen the sneak preview of Great Pumpkin Island yet, now’s the time! If you are wondering what Lucy is going to say either click HERE to go to Poptropica and find out, or wait until either me or Super Thunder does a post on what she is going to say. Also, if any of you are wondering if I’m still looking for authors, I still am. Anyone who wants to can leave a comment on either the post I did about wanting authors (click HERE to go there), or on the Become an Author page (click HERE to go there). 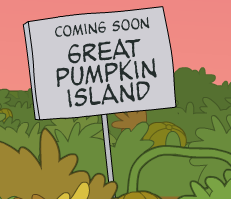 Have you seen the sneak peak for The Great Pumpkin Island? If you haven’t, you might want to check it out. If you have, there have been some changes made. When you go to The Great Pumpkin Island, go right until you see Linus. If you talk to Linus, he will start talking about the great pumpkin. Charlie Brown is to the right of Linus. If you talk to Charlie Brown, he will tell you about how Linus always spends Halloween night waiting for the Great Pumpkin and how it is impossible to convince him that there is no such thing as the Great Pumpkin. Sorry I can’t include pictures right now, I will try and add them later. Edit: Okay, I got the pictures! Here they are! One of the signs you will see. Linus, who is sucking his thumb and has his blanket with him (as usual). The other sign that you will see.